Minneapolis, MN (PRWEB) August 26, 2008 -- SpecTech, Inc., a Minnesota company that develops, manufactures and distributes products that make life easier, today announces the launch of the MAGnet Gun Caddy, along with the official website: www.magnetguncaddy.com. The product is a portable magnetic gun rack that provides a smarter way to temporarily rest an unloaded gun while protecting the hunter's vehicle. It is specifically designed for hunters preparing for, and returning from, the field. Small and light enough to fit in any pocket, the product can easily expand a gun locker holding capacity. Mr. Mike Kasbohm, CEO of SpecTech, Inc., is quoted as saying, "Our Company has a passionate respect for hunting and hunters. We sincerely appreciate that our customers are discovering how the MAGnet Gun Caddy enhances their hunting experience. Additionally, we are truly excited that we can offer our manufacturer and distributor partners a unique way to extend their brand with this product." 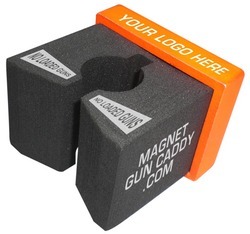 The company's manufacturer and distributor partners now have the opportunity to utilize the MAGnet Gun Caddy as a custom branded promotional item. SpecTech is currently in negotiations with hunting stores across the Midwest in keeping with its plan to further expand the availability of the product. The Magnet Gun Caddy will be featured in the September issue of Shooting Industry Magazine. Additionally, the product will be highlighted on their new products section of their Website. Founded in 1993, SpecTech, Inc. manufactures and distributes a wide variety of products to a number of industries, some of which include, retail, janitorial, hospitality, medical, banking, entertainment and vending. Their products range from time and money saving devices to components designed for security and retail delivery systems for the banking industry. SpecTech's STI Entertainment Network provides computerized photo booths to the vending and party rental industries.